After our extremely warm weekend, cooler temperatures will continue until Thursday. Tomorrow night there is a possibility of some snow showers to fall, which may put down a quick inch of snow on grassy surfaces. Nothing major, but it is something…. By Thursday morning, a strong low pressure system will come northeast and hug the coast. A good 1-2 inches of rain could fall from this system before a cold front brings in the arctic air behind it. Next weekend, temperatures will be in the 30s and lows in the teens. Next week, in my opinion, is the start of the winter pattern. It will be more stormy. It will be cold. February will be the month where we have the best chance of a major snowstorm. Right now our next chance of some snow is January 19th-21st. There has been some model guidance showing a storm hooking up with the cold air and phasing with the jet during this time period. This 19th-21st storm will be the sign whether there’s a pattern change actually occurring. There have been a few signs that the La Niña, which has contributed to our warm winter, will weaken. The SOI, a common telecommunication used to measure La Niña/El Niño strength, has been going negative. This means that the Niña is weakening. For the first part of this winter, the SOI values have been extremely positive signifying a strong La Niña. 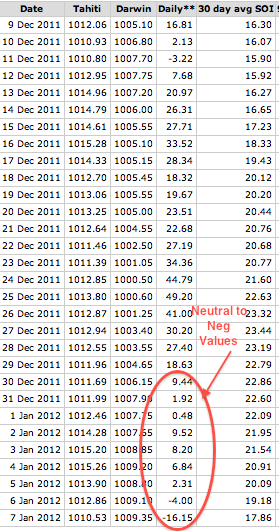 But over the past week, it has gone neutral to negative, which may signify the El Niño taking over. If this is the case, history supports a brutal February and March. Snowstorms and record low temperatures into early spring would be expected if the SOI is accurate. Right now, I am not sure if we are seeing a major change in pattern. The SOI could go positive again, meaning we are back to the warm and rainy winter. I will continue to monitor the SOI over the next few weeks.